So my roster comes out and my mom gasps: LYZE! You’ll be in Hong Kong for Halloween!!!! We look at each other and breathe the same word: DISNEY. Dressing up for Disney Halloween Time at Hong Kong Disneyland Halloween is the perfect time of the year to assume a different identity and personality. 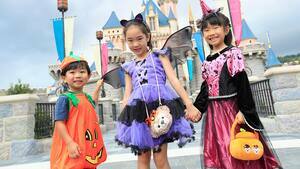 Let loose and explore your dark side with some costumes at this year Disney Halloween Time at Hong Kong Disneyland! My costume was pretty straightforward. It was also the only thing I brought in my suitcase! I bought the blue dress from a halloween shop and decorated it with a blue puffy ribbon and made the white overskirt. My brilliant mom decorated my slippers and made my mickey ears. Everyone wanted the ears! Luckily a really close friend of mine was also on the flight. I immediately contacted her and we made plans to conquer Disney as Belle and Cinderella! Getting there wasn’t for the faint of heart. We decided to just go in costume because it’s too much of a hassle to try to carry things and change at the park. Our flight landed at 6am and by the time we reached the hotel coffee was carrying us through. We ate a quick breakfast and changed and we were Disney bound! A cool thing about Hong Kong is the fact to get to the island you have to swap and take the dedicated MTR Disneyland Resort line complete with Mickey windows, Mickey hand rails, and excited Disney fans! Once we arrived at Disney we were immediately taken aside by security and informed we wouldn’t be able to enter the park dressed in costume as guests would become confused as to who was the Disney Princess and who was the guest. Once I showed the screenshot and worked my magic we were issued special stickers and asked to please avoid taking photos with guests as to not confuse them. Once we entered the part one of the park employees rushed up and asked if we wanted to see Ana and Elsa. Um, excuse what? Biggest frozen fan here. The next thing we know we are rushed off to meet another Disney Princess and the fingerling kicked in when we realized it was Aurora. She was so lovely!!! To use the biggest cliche ever, it was such a dream come true! She totally loved m moms ears and said they reminded her of her friends in the forest *swoon*. I know we promised to avoid taking photos with other guests but I literally couldn’t stop myself when my mini-me walked up and hugged my legs! I must have a little girl. She will own every Disney dress possible. Halloween will be every day in my household. To my happiness Space Mountain was a Star Wars theme and I demanded we ride it over and over. I don’t identify with the Rebel Alliance (personally I’m more of an Empire / First Order type) but I made an exception! Eventually the fatigue caught up with us. After the Halloween parade we made a mutual decision to head back. Once we sat down on the train we calculated the time difference and discovered that we had been awake for 22 hours. Sleep was in order! It’s always a relief when someone with obvious exetprise answers. Thanks!